No movie proves just how terrifying childhood can be quite like The Wizard of Oz. Flying monkeys, murder, witches and wizards, and a young girl being threatened with euthanizing her little dog … ah, childhood! It's a classic and one that doesn't get any less nightmare-inducing with age. Since it was filmed way before concepts like workplace safety and not drinking on the job were invented, a lot of strange things went on during filming. People got hurt. Movie history was made. Worth it? Let's see! Over the years, the munchkins have gotten something of a bad rap. There's a ton of stories about shenanigans going on after the cameras stopped rolling, and let's clear something up right now: they're not true. Probably not true. One of the tough things about The Wizard of Oz is separating fact from fiction, but according to the munchkins themselves, there was no drunken carousing, no orgies, and no need for them to be picked up with butterfly nets for shooting the next morning. In fact, the stories make them sad, so please stop it. One of the munchkins is in more of the movie than you might think, and that's Mickey Carroll. Even though the core group of munchkins was made up of a troupe of largely European vaudeville actors called the Singer Midgets, Carroll was born in St. Louis. That meant he had something big going for him: he could speak English. According to Carroll's later interviews, he was singled out of the crowd not just because he could speak English but because he could project. He got his start in vaudeville, too, describing himself as a "song-and-dance man," while many of the Singer Midgets had talents that were along the lines of strongman acts, magic, and even performing as cowboys and soldiers. When it came time for filming The Wizard of Oz, they needed people who could deliver what would become some pretty iconic lines. Carroll did, along with fellow munchkin Meinhardt Raabe (who played the coroner who declares the Wicked Witch of the East dead). It was Carroll who provided voices for the Lollipop Guild and even said the iconic "Follow the yellow brick road." He was a town crier, too, and by the end of filming, he'd spent three weeks doing voice-over work, including Auntie Em's panicked shouts when the tornado hits. When she couldn't yell loud enough, Carroll stepped in. He was one of the last surviving munchkins, dying in 2009 at 89 years old. We hope he found his own happiness at the end of the rainbow. That was, of course, Frank Morgan, whom Ray Bolger would later describe as "a divine man." Morgan played five different roles: Professor Marvel, the crying gatekeeper, the driver behind the Horse of a Different Color, the guard for the wizard, and the Wizard of Oz himself. Through the whole thing? He was more than slightly intoxicated. The first day Morgan showed up on set, he brought something with him that we honestly wish we'd thought of a long time ago. He had a briefcase, but carrying things like papers or scripts was for amateurs. His briefcase had a minibar in it. There's not a whole lot of information out there on just what was in the minibar suitcase, or how often it was restocked, and that's mostly because it was kept as a private matter on set. Ray Bolger said, "No matter how many times he retreated to the black briefcase, he was never less than a gentleman, although when he tried to stop drinking, he was often short-tempered and irritable." According to his wardrobe man, Morgan's drink of choice was champagne, and there was at least once incident where Victor Fleming, The Wizard of Oz's director, confronted Morgan and told him to drink more so he was tolerable on set. Oh, the good old days. Let's just say that Bert Lahr's Cowardly Lion costume would never, ever get made today, and that's a very good thing. If you always thought that the costume looked incredibly realistic, that's because it was. It was made from real lions. Since lion skins each have their own distinct patterns of swirls and coloring, the costuming department — and, presumably, Bert Lahr — realized that they had another problem. The idea had been to make a couple of costumes, so he would be able to swap them out during filming. The unique patterns of the real hides made that impossible for continuity, so Lahr had one single costume that weighed about 60 pounds. Now, imagine being wrapped in lion skins and carrying 60 pounds around with you all day while being under the hot set lights. Needless to say, there was a heck of a lot of sweating involved in being the Cowardly Lion, so much so that they needed to make a special purchase: an industrial drying bin to help get the costume at least marginally dry for the next day. How well that possibly could have worked, we're going to leave to your imagination. Oh, and the costume included a full mask that was glued directly onto Lahr's face, restricting him to a diet of only things that could be eaten through a straw. So not only was he the Cowardly Lion, he was the Starving Lion too. After filming, the costume was largely forgotten until it was rediscovered for a 1970 auction, where it sold for $2,400. It was later restored and went on to sell at a 2014 Bonhams auction for $3.1 million. Crusty sweat hopefully not included. 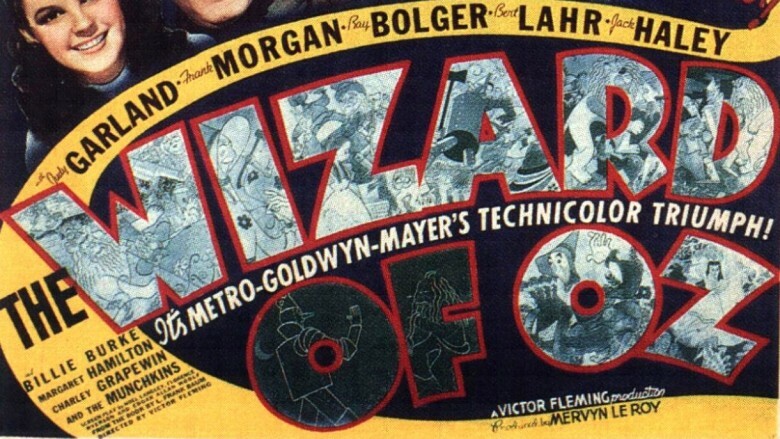 The Wizard of Oz went through a handful of directors before Victor Fleming, who stuck it out until the end. Not surprisingly, they all had their own ideas on just what the film should look like. More surprisingly, Richard Thorpe didn't envision Dorothy as anything like the innocent, salt-of-the-earth farm girl we all know and love today. Nope. We're not entirely sure what kind of farms he visited for his research, but Dorothy was originally sporting a curly blonde wig and heavy, baby doll makeup. Thorpe was on set for two weeks, and he did some filming during his time there. That included some key scenes, like everything that happened in the witch's castle and the meeting between Dorothy and the Scarecrow. Once studio execs saw what he'd done, they realized that he just might not be the right guy for the job. MGM director Mervyn LeRoy (who had pushed MGM to purchase the film rights in the first place) fired him. Later, he'd be quoted as saying, "He didn't quite understand the story." The next director, George Cukor, immediately got rid of everything that made you cringe about that description of Dorothy. He ditched the wig and the makeup and gave Judy Garland some acting advice: you're "just a little girl from Kansas." We all owe him some major thanks. Jack Haley made the Tin Man everything we all know and love, but a weird series of events put him there. The original cast list featured Buddy Ebsen as the Scarecrow and Ray Bolger as the Tin Man. The story goes that Bolger wanted to be the Scarecrow, as he was a song-and-dance man and wanted the freedom of the Scarecrow instead of the tin suit. This, we think, was a good idea. He went to MGM honcho Mervyn LeRoy and appealed his case: he'd been cast in the wrong role. They allowed Ebsen and Bolger to swap roles, and some of the movie was even filmed before Ebsen was sent to the hospital with a major allergic reaction to the aluminum dust that he was painted with. According to Ebsen, no one believed he was sick, and he was ordered back to the set until, thankfully, medical personnel got involved and gave the studio a resounding, "No way!" Jack Haley was hired, and that meant not only reshooting all of Ebsen's scenes but also having to wait a bit to do so. Moving from aluminum dust to paste, they then had to wait while Haley recovered from a severe eye infection that the paste caused. Live and learn, but Ebsen would complain of breathing problems for the rest of his life, and he didn't even get to be in the movie. Talk about getting the short end. As for Bolger, he had his share of difficulties, too. It was so hot that Bolger was, most of the time, on the brink of fainting (although we're pretty sure Bert Lahr would have been happy to swap outfits), and according to the Smithsonian, he ended up with permanent lines on his face from the mask. There was really no good choice to be made here when it came to comfort. It ended up in the garbage when they realized it looked like whatever the complete opposite of a tornado is. Because there's nothing like the pressure of realizing you just cost the studio a mind-numbing amount of money to kick-start a brilliant idea, he finally nailed the perfect special effect. He took a silk stocking and held it up in front of a fan. Seriously. That's the final shot you see in the movie, and even today, you have to admit it looks pretty good. The farm is a miniature, the tornado a piece of women's undergarments, and the rest is movie history. The 1930s weren't a good time to be a woman in Hollywood. Heck, the 1930s weren't a good time to be a woman anywhere. Judy Garland found that out in a whole bunch of horrible ways, on and off set. The Wizard of Oz's final director, Victor Fleming, was also the mastermind behind Gone With the Wind. He had very powerful friends and was known for bullying his actors to get the performances he wanted. When Garland kept laughing at the Cowardly Lion's bluster and bravado act, he didn't just stop filming and call for a retake. Oh no. That would be for amateurs. He pulled Dorothy off the yellow brick road, slapped her across the face, and said, "Now go in there and work." Imagine if that happened on a set today. Imagine the outrage. We can't help but wonder what the Cowardly Lion said. The premise was pretty simple. Our little group of heroes was approaching the witch's castle when a swarm of bugs descended on them. The Wicked Witch sent the bugs — which were known for giving their victims the "jitters" — to distract them while her henchmen swooped in, but really, it played like an excuse to do a contemporary dance number in the middle of the Haunted Forest. It'd be kind of like James Bond taking a break outside Spectre's headquarters to pull some wicked Beyoncé moves. Supposedly, there was more to the whole jitterbug plot, but with bits and pieces of story falling off the original script like underfed zombie bits, it ended up being incredibly odd. Today's lesson? If you're ever attacked by a swarm of mosquitos, try choreographed dance moves. If you say you weren't the least bit afraid of the Wicked Witch of the West, you're a liar. We're still a little bit afraid of her, and we stopped sleeping with a nightlight ages ago. The flying monkeys were terrifying, and how bad did she have to be if she was in charge of them? Margaret Hamilton was totally the type to suffer for her craft, though, and while there were a whole bunch of missteps and accidents that would have today's stars calling their lawyers, hers ranks right at the top. When the witch makes her exit from Munchkinland, she drops through a trap door, and jets of flame spit up from the spot she "disappeared" from. The first take went perfectly, but the ever-vigilant director Victor Fleming wanted another take, just in case. On that one, Hamilton's hat and coat caught on fire, burning layers of skin off her face and hands. Bad, right? It gets worse. Did you forget she was covered in green paint? The only way to get the paint off her raw, burned skin was with alcohol. You cringe just thinking about it. She left the set for six weeks and returned before she had even completely healed. Since they couldn't reapply the green paint, she wore gloves for the rest of filming. Not surprisingly, she had lost a bit of faith in the special effects department and refused to do any more fire-related acting. They still had that famous skywriting sequence to film, and that required an actress who was willing to sit on a broomstick that wasn't a broomstick: it was a pipe. It was also filled with fire. Also? It exploded. Hamilton's stunt double, Betty Danko, was hospitalized for 11 days. Presumably she never worked with fire again either. You know the scene, the one you watched as a kid, probably thinking this wasn't the way things were supposed to go. The good guys were always supposed to win, but here was the Wicked Witch putting our erstwhile heroes to sleep with a spell. They fall asleep in a field full of poppies, and then snow starts to fall. Only, that's not snow that's falling on them. It's asbestos. Pure asbestos, too, not even the stuff that's processed and used for building materials but still considered massively dangerous. Nope. Not processed at all. They were covered with what's officially called chrysotile asbestos fibers, and at the time, that wasn't odd. Asbestos was often used to simulate fake snow, even in department stores — and that brings a whole new meaning to telling Junior not to eat the snow. Do you know what else was asbestos? The Wicked Witch's broom, for one thing, and part of the Scarecrow's costume, for another. That's right, Ray Bolger was dancing around in asbestos, under falling asbestos, not even knowing he was giving mesothelioma the big ol' middle finger. And that is exactly why the good guys always win: they're pretty badass.